Riordan, R. (2005). The lightning thief. New York, NY: Disney/Hyperion Books. The Lightning Thief, the first book in the Percy Jackson & The Olympians series, is a refreshing and modernized take on the Greek gods in this dangerous adventure of a newly discovered and reluctant hero. The Greek gods are still active in the 21st Century as we discover that Mount Olympus is above Manhattan and the Underworld is below Los Angeles. Rick Riordan combines a good deal of true Greek Mythology along with a humorous and sardonic tone with plenty of desirable action-packed sequences that tween readers or older and girls and boys alike will enjoy. Percy Jackson, after being expelled from one school after another after always being blamed for the most bizarre of events, Percy is sent to Yancy Academy, a private school for troubled kids in upstate New York. Things don’t get too much better their either. His ADHD is getting worse and so is his dyslexia. Either when he tries to read it looks like gibberish and dead languages seem to actually make sense to him. The school councilor told him not to worry about it, that his ADHD is making him misinterpret things. On a school field trip to the Metropolitan Museum of Art with Greek and Roman exhibits, one of his teacher’s Ms. Doods changes into a creature and attempts to kill him. Another teacher, Mr. Brunner hands Percy a pen that turns into a sword to fight the off creature. He decides must tell his mother no matter how unbelievable this may seem. His mother has always referred to his father that’s been absent from the picture his whole life as the best thing that has ever happened to her. But Percy is angry at his father for going off on a sea voyage and never returning because now they’re stuck with rude, complaining, and moldy pepperoni pizza smelling Gabe. His best friend Grover that says he’s Percy’s protector along with his mother leave the busy city so he can go to yet another place for people like himself. This time he has no idea how different people like him are. When being attacked by bull-man, his mother seems like she understands all of this and his best friend Grover removes his pants during the attack and appears to have goat-like legs. As they arrive at a place that appears like a summer camp, the bull-man kills and vaporizes his mother (so it seems). This camp is designed to keep all full-blooded humans out. Percy learns he is a demi-god, the son of Poseidon and at Camp Half-Blood (Long Island, NY); he meets other demi-gods and mythological creatures. Grover is actually a satyr, his teacher Mr. Brunner known as Chiron the centaur. And to his somewhat surprise discovers that Mount Olympus and all he knew as mythology is now reality. And his ADHD and dyslexia were misdiagnosed due to the fact that that this is normal and often a sign that someone is a half-blood. And if this isn’t all overwhelming enough for 12-year-old Percy, he is also accused by Zeus of stealing his master bolt and Hades’ helm of darkness (which he did not) and return them by the summer solstice otherwise the world (mythological and not) will be at war. So, Percy, his friend Grover, and his new Camp Half-Blood friend Annabeth, daughter of Athena, all go on a quest to find and return the stolen items after he discovers his mother is still alive and Hades’ hostage. The three encounter Medusa, Procrustes, Chimeras, and Furies while they search for the gate to the underworld. Along the way, Percy discovers he has some breathtakingly godly powers, many of which are water related. They also find out that Aires has both the master bolt and helm of darkness which he retrieves after a duel. After both items are returned to the rightful owners, Percy’s mother turns his step-dad Gabe into stone using Medusa’s head, the trio Annabeth, Grover and Percy return to Camp-Half Blood as heroes, and Percy comes to find out that Luke, another teenager at Camp-Half Blood, son of Hermes, was behind the thefts and his mother being vanquished and even as the book concludes he tries to kill Percy summoning pit scorpion. And, it’s no surprise that Percy chooses to stay at Camp Half-Blood rather than return back to his school. He continues his battle training, and as the son of Poseidon his many adventures have yet to come to an end. 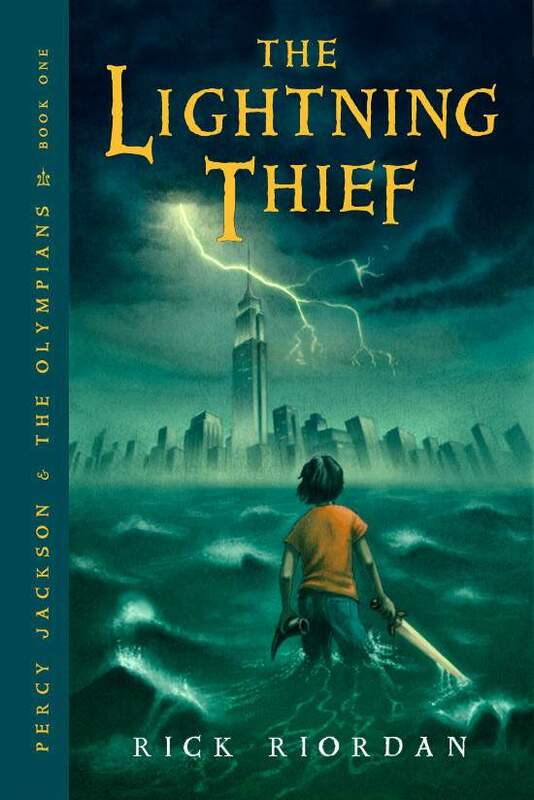 If you enjoyed The Lightning Thief, then you’ll be eager to continue the Percy Jackson & The Olympians series (The Sea of Monsters, The Titan’s Curse, The Battle of the Labyrinth, The Last Olympian) or Rick Riordan’s newer mythological series such as The Heroes of Olympus (The Lost Hero, The Son of Neptune, The Mark of Athena, The House of Hades) with Roman demi-gods or the Kane Chronicles (The Red Pyramid, The Throne of Fire, and The Serpent’s Shadow) based off of Egyptian mythology. Rick Riordan does not alter the origins of Greek mythology making The Lightening Thief, and the rest of the Percy Jackson & The Olympians books to have ample classroom/library curriculum potential beyond it’s already and insanely popular pleasure reading as well as having a movie based off of the first book The Lightning Thief.